In April 2017, Gender Pay Gap legislation came into effect under the Equality Act 2010. This requires any employer with 250 employees or more to publish their gender pay gap for their employees. We are committed to treating our people equally and fairly and welcome the opportunity to report on our gender pay gap data. Our gender pay gap is significantly lower than the national average of 18.1%, as reported by the Office of National Statistics. Our mean gender pay gap is -1.6%, meaning that on average, our female employees receive a higher rate of pay. This is driven by the fact that we have a higher percentage of women than men in our more senior roles. 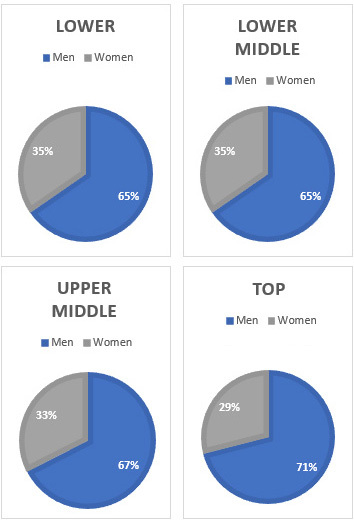 We have found no inconsistency between how we pay men and women for the same role, although there is a pay gap driven by the makeup of male store managers versus female store managers in differing store sizes. 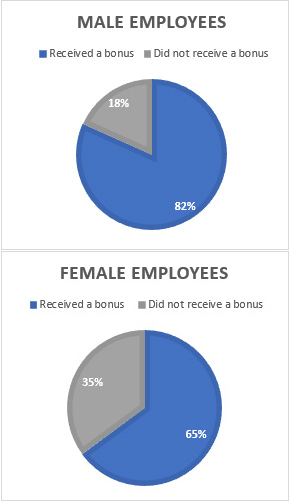 The reported data for average bonus shows a gender gap of 66% in favour of men. This difference is driven by the addition of a number of new female participants in the senior leadership scheme who are not benefitting from legacy pay-outs, compared to male participants with longer service. We expect the gap to even out in future years. The data below shows we employ a high proportion of men at all levels across the company. This difference is slightly higher in our more senior Head Office roles, which sit in the upper to top quartile of our total population. The table below displays the gender pay gap, both mean and median and captures the difference between the hourly rate of male and female employees. The proportion of male and female employees who received a paid bonus reflect the higher number of males in higher paid senior roles. All employees have an equal opportunity to receive bonus pay which includes commission. The table below captures the difference between the average bonus pay paid to male and female employees across the business. We are confident that our male and female employees are paid equally for doing equivalent jobs. We are equally supportive of the development of men and women and have policies in place to ensure the fair and equal treatment of men and women. We continue to focus on ensuring opportunities are open and fair for both women and men.